over two years since it began the production process. 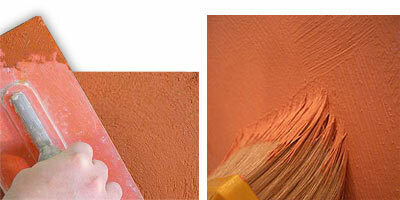 The lime finish is applied by brush, trowel, sponge floated or steel troweled according to the desired final effect. A chemical reaction starts immediately while drying. The carbon dioxide present in the atmosphere combines with calcium hydroxide present in the coating. The calcium hydroxide becomes again calcium carbonate (limestone), creating an extremely durable surfaces in our finish, the Grassello di Calce will slowly become that rugged mineral which was taken from the river bed limestone. A point to remember is that this final part of the cycle is extremely slow. In fact to obtain 100 Kg (220 lb) of carbonated lime (calcium carbonate) requires 63 Kg (138 lb) of calcium hydroxide (grassello) and 37 Kg ( 82 lb) of carbon dioxide. When you think that carbon dioxide is only 0,03% by volume of air, you realize how gradual this phenomenon is a process at the speed of nature. 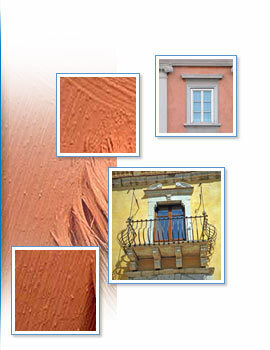 Lime based finishes because of their high pH (12–13) are themselves a natural biocide. Therefore they do not promote the growth of mold. Thanks to their nature they create anti-static surfaces, that do not attract dust and dirt. They have a high water vapor permeability, which helps the natural vapor-flow through the walls, reducing the risk of blistering and peeling in humid areas. That is a typical phenomenon which is instead favored by acrylic coatings that cover the walls like a protecting and water-proof overcoat, but reduce drastically the water vapor transmission. Good quality lime and aggregates create finishes with warm, comfortable and vibrant colors. The color depth on the walls enriches the architectural and design elements of the house. A wall plastered with a good lime finish gets richer and richer with age, emphasizing the natural shadowy and cloudy look of the lime colors.